Ian and I are committed to producing high quality beef while taking advantage of the abundant and highly nutritious grass forage on both of our farms . Our move to Grassfed beef reflects our philosophy that beef cattle ranching done as it was by our grandparent is truly sustainable agriculture. We believe and practice low stress cattle raising techniques, and have developed our farms to facilitate careful handling of our animals. Reduced stress during transport and before processing is a significant factor in the tenderness of our beef. We also take care in selecting young cattle for our beef which also enhances it's tenderness. Typically both the amount of connective tissue (collagen) and the resistance of collagen to breakdown during cooking increases as the animal becomes older. 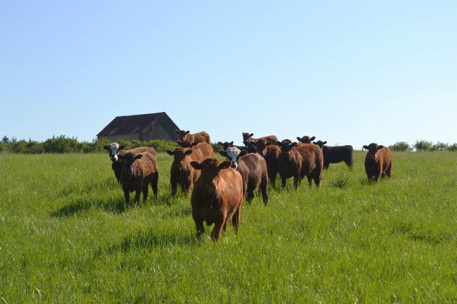 By concentrating on forage quality and cattle genetics (Red & Black Angus) suited to Vancouver Island pasture we are able to produce a local beef that has exceptional eating quality. Our continued business success is based on our beef flavor, juiciness and tenderness so we guarantee your satisfaction. Our beef's quality is a result of good production practices at the farm, as well as at the meat processing and butchering facilities. By dry aging our beef in a temperature-controlled hanging room for 21 days we are able to enhanced it's tenderness through the actions of natural enzymes, "you can taste the difference".